Amatrol’s Portable AC Variable Frequency Drives Troubleshooting Learning System (990-DRV1F) teaches the fundamentals of configuring and operating an AC variable frequency drive. The system includes industry-standard components, such as an Allen-Bradley PowerFlex 4 variable frequency AC drive and a 3-phase AC motor, in a convenient, portable case that can be used virtually anywhere. The system also features FaultPro, Amatrol’s exclusive electronic fault insertion software. 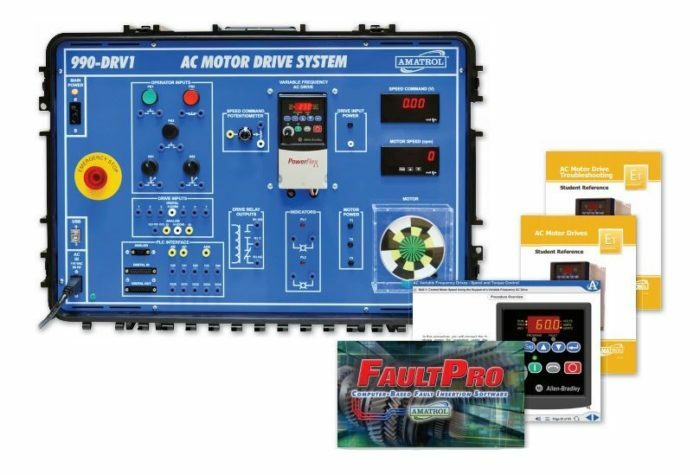 FaultPro allows users to learn motor drive troubleshooting skills, such as drive input, motor input, and drive relay troubleshooting. FaultPro allows users to troubleshoot realistic situations they will encounter on the job in industries like packaging, textiles, and paper where rapid motor acceleration and deceleration are required. The variable frequency drives training system features FaultPro, Amatrol’s exclusive electronic fault insertion system. FaultPro allows users to insert more than 20 faults into the system for realistic troubleshooting of situations they will encounter on the job. FaultPro’s computer-based faults automatically track progress, enabling learners to gain troubleshooting skills in a self-paced environment that ensures that faults are inserted safely, protecting both learners and equipment. The variable frequency drives training system allows learners to practice hands-on skills with industry-standard components, like an Allen-Bradley PowerFlex 4 variable frequency AC drive and a 3-phase AC motor. Learners will gain real-world experience that will prepare them for work opportunities. The system also includes: onboard analog and discrete input devices that enable learners to operate the drive in many different program applications; a digital tachometer to monitor output; a digital voltmeter to monitor analog input into the motor; and a lockout/tagout kit to learn vital safety skills when working with AC motors. Amatrol’s curriculum features a highly-interactive, multimedia format that includes stunning 3D graphics and videos, voiceovers of all text, and interactive quizzes and exercises designed to appeal to learners with different learning styles. The variable frequency drives training curriculum teaches learners about the operation, installation, and performance analysis of AC motors. Learners will also gain experience with relevant hands-on skills, such as operating a variable frequency AC drive to provide low speed boost. Other major topics include jogging and torque control, ramping commands, DC injection braking, acceleration methods, and troubleshooting various system faults. Sample copies of the AC Variable Frequency Drives & AC Variable Frequency Drive Troubleshooting Student Reference Guides are also included with the system for your evaluation. Sourced from the system’s curriculum, the Student Reference Guides take the entire series’ technical content contained in the learning objectives and combine them into perfectly-bound books. Student Reference Guides supplement this course by providing condensed, inexpensive reference tools that learners will find invaluable once they finish their training, making them the perfect course takeaways.